But that otherwise concludes our coverage of this afternoon's Premiership action. You can click the links below to read more about everything that's happened but, until tomorrow, it's goodbye from us. And maybe, just maybe, the biggest game of the weekend is still to come! Tomorrow, Newcastle Falcons face London Irish in what is certain to be a Premiership relegation decider. Simply put, it's going to be huge. Sale Sharks and Bath also do battle from 14:30 BST and, as always, you can follow live text and radio commentary on both of those fixtures right on this very website. So what does all of the below mean in terms of the Premiership table? Well, if you're a Northampton fan, it's probably best to look away now. 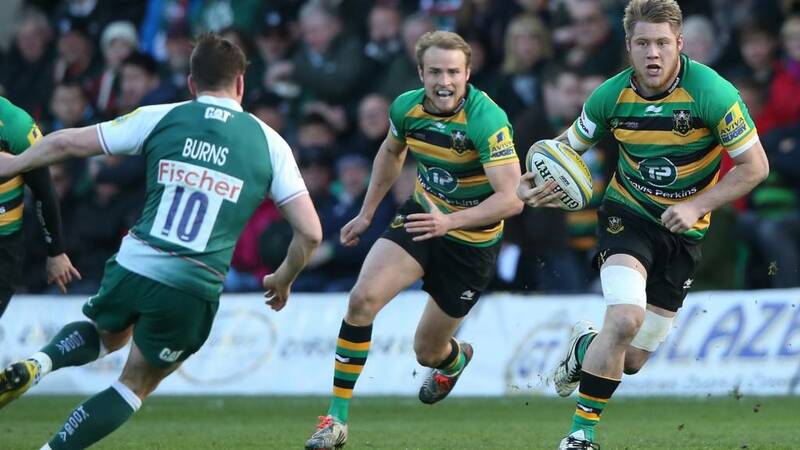 Leicester Tigers in fourth have now pulled a seven-point gap on the fifth-placed Saints with two matches to play. Have those play-off spots now been just about decided? I just caught the ball and ran! But seriously, it means a lot to us and it means a lot to the fans to win here. That was a long last 20 minutes. But credit to the lads, we knew we needed to come here and cement our place in the top four and we've managed to do that. To dog out a win like that against a good Saints team is credit to the boys. But, having switched the ball from left to right, Northampton run out of room and Leicester are celebrating. The Tigers have done it - but my word they made that a lot harder for themselves than they might've done. We're into the final minute and Leicester will insert at the scrum. The camera pans to a nervous-looking Richard Cockerill. "Just hold it steady now, boys." But not if Leicester have anything to do with it! A thumping challenge from Peter Betham means Northampton knock-on - and that could well be that. JJ Hanrahan lands the kick and Northampton have around three and a half minutes to save their season. And yet another Saints penalty - the 16th conceded by Leicester this evening! The scrum, to put it politely, has been a bit of a mess all evening and continues to be so now. Leicester are into the Northampton half, stringing a few sequences together before knocking on and surrendering possession. Time is ticking for the home side. The stats show that the hosts have made more metres, enjoyed more carries and broken the gainline more often than their opponents... Yet they're still nine points in arrears. And their scrum is continuing to fail them a wee bit too, conceding a penalty and allowing Owen Williams - recently on for Freddie Burns - to kick long and into touch. Tom Croft concedes a penalty for a late challenge on George Pisi though, so Saints are back on the attack again before you know it. These East Midlands derbies are never dull, are they? But now it's Northampton's turn to attack again - Harry Mallinder dancing, twisting and skipping his way 30 metres upfield. They're five metres from the line in a flash... But it's turned over and booted clear. And Freddie Burns has the simplest of tries out wide! Goodness me, how easy was that for the away side? Too easy, I'd say. The fly-half, after a bit of afters with Harry Mallinder, picks himself up, dusts himself off and knocks over the extras too. Could that be the decisive score?